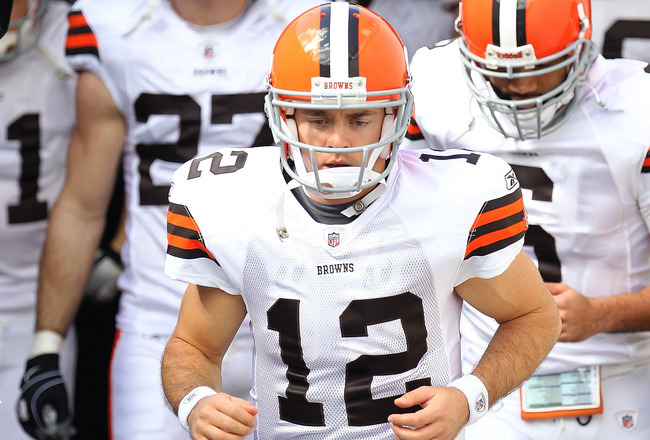 Lots of chatter today on the theory put out by ESPN Cleveland’s Tony Grossi that the Browns soured on Colt McCoy after Brad McCoy, Colt’s father, went off about the circumstances surrounding Colt’s concussion at the hands of Pittsburgh sociopath James Harrison. Grossi wrote that: I was told at the time that Brad McCoy’s comments meant the end of McCoy in Cleveland, but I didn’t believe it then. The comments did not drive the pursuit of a new quarterback, but I believe they contributed to McCoy’s demise. OK, this is all pretty simple. First off, the Browns need to tell Brad McCoy to bugger off. This isn’t a high school game in Texas, it’s the NFL. The front office has enough problems trying to rebuild the Browns into a viable NFL franchise without worrying about what the back-up quarterback’s daddy thinks. Second, because he is six years younger than fellow quarterback Seneca Wallace, the Browns needs to dump Wallace and keep McCoy as the backup to new starter Brandon Weeden. There, problem solved and the non-story is put to rest. Only in friggin’ Cleveland do we have to deal with this kind of nonsense.